Lunch sponsored by Lawrence Buffalo Wild Wings will be passed out at registration. Dinner, prizes and raffle drawings follow golf in the Club Room at Old Oakland Golf Club. Please check which sponsorship you would like. Sponsorships are given on a first come, first served basis. Includes your company name and logo featured in the title of the outing, in all promotions and any media contact. You will also receive a foursome in the outing, exclusive hole sponsorship sign, 12 months of website advertising and additional recognition signage for the event. Exclusive sponsorship for the all new practice and short game complex; recently added at Old Oakland. Includes a foursome in the outing and print and digital company logo. Receive a foursome in the outing, individual hole sponsor sign, web advertising for 6 months, name recognition on additional marketing material for the event. A great way to network with every golfer on the course. This level includes location at the tee box to conduct fun activities/giveaways; recognition on signage for the event. Ride with a beverage cart driver, network and help quench golfers thirst. There will be your company logo on the cart for brand recognition. Want your team to stand out? Old Oakland is one of the only golf courses that offer GolfBoards in Indiana. This sponsorship doesn't include the price of your foursome but includes four GolfBoards with your company logo featured on them. Click the link to check them out! Includes a hole sponsor sign, web advertising for 3 months and recognition on additional marketing material for the event. Sponsor includes exclusive signage at the contest hole, recognition printed and digital?FlightScope Xi is the next generation of launch monitors that uses 3D Doppler tracking radar. Click link to check it out! Sponsor one of the two listed items includes exclusive signage at the contest hole. Opportunity to market your business, but would rather not golf or can?t attend. Have us place a flag or sign on a green to showcase your company. No limit to how many flags or hole signs you can purchase. 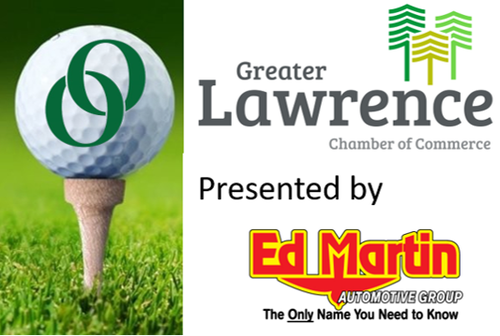 Score a hole in one on a par 3 and win a new car compliments of Ed Martin Automotive Group. Lunch boxes sponsored by the Lawrence Buffalo Wild Wings will be passed out at registration. Registration fee includes: Green fees, golf cart, Lunch, Dinner, Beverages, Prizes.